Newbery Medalist Laura Amy Schlitz brings her delicious wit and keen eye to early twentieth-century America in a moving yet comedic tour de force. Fourteen-year-old Joan Skraggs, just like the heroines in her beloved novels, yearns for real life and true love. But what hope is there for adventure, beauty, or art on a hardscrabble farm in Pennsylvania where the work never ends? Over the summer of 1911, Joan pours her heart out into her diary as she seeks a new, better life for herself—because maybe, just maybe, a hired girl cleaning and cooking for six dollars a week can become what a farm girl could only dream of—a woman with a future. Newbery Medalist Laura Amy Schlitz relates Joan’s journey from the muck of the chicken coop to the comforts of a society household in Baltimore (Electricity! Carpet sweepers! Sending out the laundry! ), taking readers on an exploration of feminism and housework; religion and literature; love and loyalty; cats, hats, and bunions. Laura Amy Schlitz is the author of the Newbery Medal–winning Good Masters! Sweet Ladies! Voices from a Medieval Village, the Newbery Honor Book and New York Times bestseller Splendors and Glooms, and several other books for young readers. A teacher as well as a writer, Laura Amy Schlitz lives in Maryland. The beauty of this novel is that it dares to go beyond the school-is-cruel and paranormal-dystopian-romance conventions and lets its adolescent heroine think on the page about what makes a human being whole: art, love, faith, education, family, friendship. Written as a diary, the first-person narrative brings immediacy to Joan’s story and intimacy to her confessions and revelations. The distinctive household setting and the many secondary characters are well developed, while Joan comes alive on the page as a vulnerable, good-hearted, and sometimes painfully self-aware character struggling to find her place in the world. A memorable novel from a captivating storyteller. The diary format allows Joan's romantic tendencies full rein, as well as narrative latitude for a few highly improbable scenarios and wildly silly passion. Tons of period details, especially about clothing, round out a highly satisfying and smart breast-clutcher from this Newbery-winning author. Joan is reminiscent of heroines like Anne Shirley, Jo March, Cassandra Mortmain, and her own favorite character, Jane Eyre...Her overactive imagination, passions, and impulsive disregard for propriety often get Joan into trouble, but these same qualities will endear her to readers everywhere. Coming-of-age drama and deeper questions of faith, belonging, and womanhood are balanced with just the right blend of humor. A wonderful look into the life of strong girl who learns that she needs the love of others to truly grow up. The book is framed as Joan’s diary, and her weaknesses, foibles, and naiveté come through as clearly—and as frequently—as her hopes, dreams, and aspirations...by the end readers feel as if they’ve witnessed the real, authentic growth of a memorable young woman. Fans of Little Women, rejoice. Janet's impassioned diary, inspired by Schlitz's own grandmother's journals, explores themes of faith and feminism, love and literature, culture and class in early 20th-century America, all the while charming readers with a vivid cast of characters. What a heroine, not just for the early 20th century, which Ms. Schlitz skillfully evokes through Janet’s impressions, but also for our own time. An unsophisticated girl who thirsts for education, an impulsive idealist who, when she errs, passionately seeks to put things right: Janet Lovelace is an utterly endearing young woman on whom not a second of youth, it seems, will be wasted. Brava to Laura Amy Schlitz, whose enchanting writing has brought such a spectacular character to young people’s literature. An enlightening portrayal of a young girl’s struggle to assert herself at a time when women’s rights were just beginning to be established...Joan’s strength and determination, despite the expectations of a young woman’s attitude and behavior at the time, are inspiring to young readers. Readers of all ages will find her an appealing heroine. ...fans, who appreciate historical fiction as intelligent as it is entertaining, will be well pleased. Joan is a true heroine with whom readers are sure to sympathize, and her exciting and humorous adventures will keep readers engaged. Written in diary form with the Voctorian eloquence reflecting Joan's love of Jane Eyre, this novel is sure to inspire girls of any background and lead to greater understanding of Jews and Judaism. [Joan's] strong voice allows the reader to understand and sympathize with her feelings and dilemmas. This is a book which can open up discussion on religious tolerance, cultural class distinctions, and women’s rights. An unusual novel, brilliantly executed, this book is well worth the reader’s time and will not be easily forgotten. 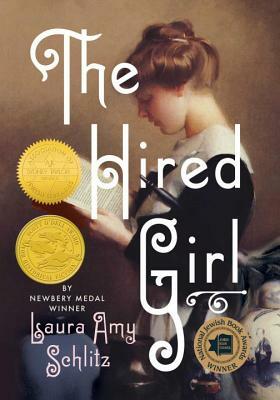 "The Hired Girl" is a tender, utterly captivating story about a girl grasping onto small kindnesses and trying to better herself—a classic American story.